Lucille Edna Thronson died April 24, 2013. She was 97. She was born on June 30, 1915 in Aurora, Ore. to Harley and Edna Swigart. She was raised in the Molalla area and graduated from Molalla Union High School in 1934, and worked as a bookkeeper in Molalla for several years. She married Chester M. Thronson on Aug. 16, 1941. Mrs. Thronson was a devoted wife, mother and grandmother. She enjoyed gardening, baking, cooking, and was an excellent seamstress. 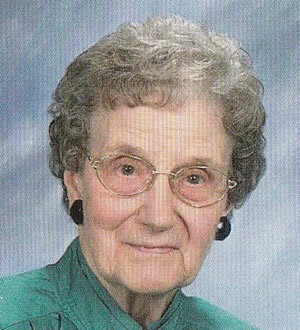 She was a long standing member of the Molalla Methodist Church and was involved in several women’s groups. She is survived by her daughters, Cara Tyler of Orlando, Fla., Roma Hall of Beaverton, Linda Davidson of Centrailia, Wash., and Laura Garvey of Sherwood; brother Elwin Swigart of Molalla; eight grandchildren; and eight great grandchildren. Chester M. Thronson preceded her in death. Memorial services are scheduled for May 4, 2013 at 1:00 p.m. at the Molalla Funeral Chapel followed by a graveside service at Adams Cemetery. Memorial contributions may be made to Bristol Hospice Oregon, Adams Cemetery or Casey Eye Institute. Reprinted from the 04/30/2013 Online Molalla Pioneer.